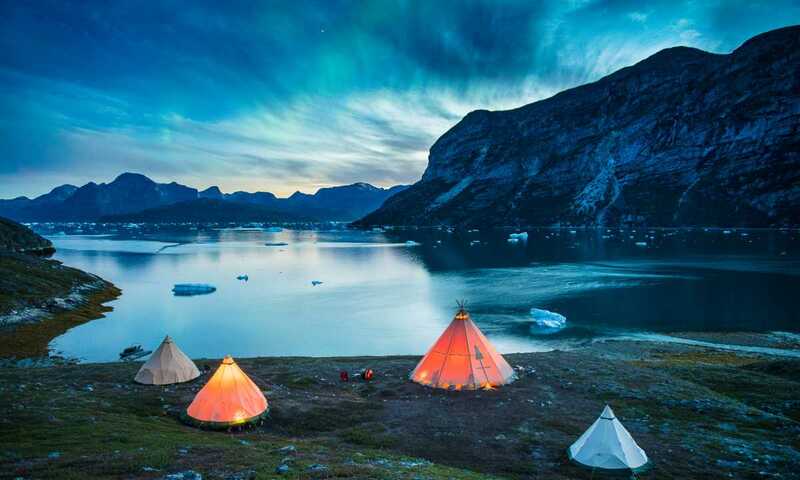 An amazing opportunity to glamp Greenlandic style in true wilderness with a good dollop of comfort thrown in. Spend time with your guide fishing, kayaking through ice or trekking in spectacular surroundings and visit local communities, before returning to meals prepared by an award winning chef! We will pick you up at the airport, in the smallest capital in the world! After a tour briefing and gear check, we will cruise to our camp looking out for whales and seals along the way. There will be a guided walk upstream from camp to a waterfall, where we can enjoy a cup of tea or coffee while taking in the sights. Back at camp you can settle into your private teepee tent (with a private bathroom teepee tent) access all of the camp’s facilities and feast on gourmet meals. Choose from a range of guided and individually-adapted activities including kayaking, trekking, char fishing, a boat cruise through the fjord and local community visits. After each day’s activities, prepare to relax and enjoy all of the facilities and delicious meals back at camp. After breakfast in camp, we will cruise back to Nuuk where there will be time to enjoy the city, have some lunch and pick up any last minute souvenirs before your transfer to the airport for departure. This trip can run as a group trip, with prices starting from $3,221 per person for a complete group. If you are looking to join a group or you are a solo traveller we will help to form likeminded groups of travellers. Please let us know your travel plans. The following are all included in the all-inclusive price: kayaking, trekking, char fishing, boat cruise through the fjord, local community visits. Child policy: there’s no minimum age and the camp is ideally suited to families.